I wish I could find a video of John Eastman’s entire appearance before the House Ways and Means Committee hearing on the IRS scandal yesterday. John wears many hats, but yesterday he appeared as chairman of the National Organization for Marriage. The NOM site links to the committee video of yesterday’s hearing at this link. Steve posted the video of John’s statement here. Below John responds to Democratic Reps. Earl Blumenauer — the jackass with the bicycle patch on his sport coat (photo above left) — and Lloyd Doggett. 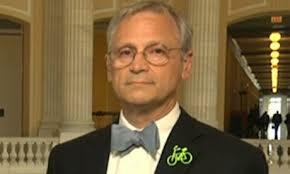 While we’re on the subject of Blumenauer, see his “bicycle goals” for the 111th Congress. These Democrats apparently join Washington’s Baghdad Jim McDermott among those who haven’t gotten the memo on the Democratic line on the scandal, as Charles Krauthammer puts it — or as lap dogs of the left, as he also puts it. The cause of their buffoonery is overdetermined. More Eastman at Nice Deb.